Esther Kohler has no fallback plan: She says, “I had, somehow, managed to graduate with a theater degree from Northwestern, but without a job or a trust fund I had to choose between moving home and suffering the rancid fate of a nomadic couch surfer.” Reluctantly, she chooses her parents’ house, and settles into summer with intentions of reading children’s books and contracting a chronic illness. 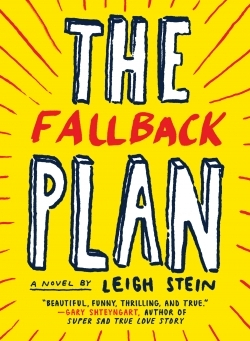 Thus begins Leigh Stein’s novel, The Fallback Plan, which chronicles Esther’s endeavors to figure out what on earth she’s supposed to do next. The Fallback Plan may be Stein’s first novel, but she’s no amateur. The story falls prey to no easy outs, and the prose is fluid, biting, and often laugh-out-loud funny, a difficult feat for even a more seasoned writer to achieve. Like many recent grads, Esther bemoans the impracticality of her education: “I had learned so much—how to drink imaginary hot coffee, the definition of chlomfluorocarbon—and yet I was prepared for nothing. I didn’t know how to shift bicycle gears.” This humor serves Esther well as she begins the babysitting job scrounged up by her parents. Of watching four-year-old May while May’s mother, Amy, works on art projects in the attic, Esther says, “Once I’d realized that to be a good babysitter I only had to be willing to behave like a four-year-old, but with a keener eye for potential dangers, I liked my new job very much.” Playing with May becomes Esther’s new escape, a replacement for being on the stage, but when things at May’s house take turns for the worse, Esther is forced to confront the complicated demons of adulthood, no matter how much she’d rather stay in hiding. Though peppered with moments of self-pity—“What am I doing? I thought. I should join the Peace Corps. I should read to blind people“—this is ultimately a novel of hope. While looking at the flowers she planted months before, Esther says, “Here were these lilies, which only grew because I’d made them grow. May could hula hoop on one foot because of me. There had to be other things I could do.” Esther’s story is not a typical stumble into adulthood, but rather, a hilarious yet heartfelt—and sometimes heartbreaking—account of what happens when a girl is forced to come up with plan B and discovers it might be better than she let herself believe.